Looking to install new kitchen cabinets in your home? 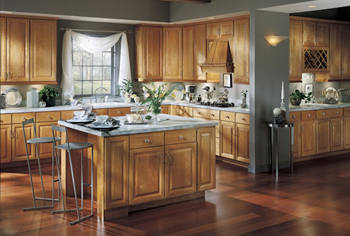 Stop by or call Floors & Kitchen in Sterling Virginia to discuss your options with our cabinet experts. 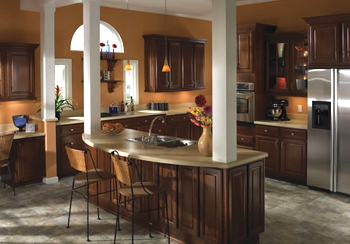 Cabinetry options range from manufacturer, color, style, material and more. With so many options, it’s best to review them with one of our experts. With years in the cabinetry business, we know the ins and outs that can save you time and money. Not to mention options you may not have even considered. A few styles to choose from are the arch style, the raised panel style and the flat panel style. Not sure what these look like? We can show you the difference and tell you the difference each can make to the look of your home. There are also several materials to choose from. Then you have to think about what finish you would like. Some options are light finish, medium finish, and a dark finish. Some of the primary manufacturers we use are Armstrong, Cabico, and Rosewood. Why choose a manufacturer like Armstrong? When it comes to installing a major feature in your home such as cabinetry, quality is always the best choice. 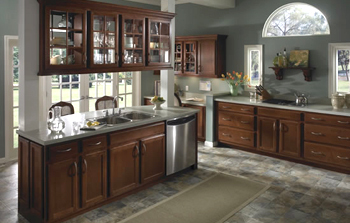 Armstrong offers a large selection of fine quality, semi custom kitchen and bath cabinets. Armstrong is also a member of the National Kitchen and Bath Association. Which is a non-profit association that has led the kitchen and bath industry for many decades. They’ve led the way since 1963 to be exact. There are far too many options and aspects to consider to be listed here. Which is why you should call Floors & Kitchen of Sterling Virginia today to discuss your many options with one of our cabinetry experts. Give us a call today at: (703) 444-5595.